Michelin Tires is offering a puncture protection, Protek, in two variants: a 1.5mm thickness foam under the tread only, or a much thicker version that also covers the bead and part way up the sidewalls. There is said to be many sizes but we are waiting for the press release to know full details. Sonoma Bicycles were on display, unfortunately no one was manning the booths for inquiring eyes and minds. From a little Google searching I learned that these shaft drive bikes start at $350 for beach cruisers up to $499 for the Urban Voyager. Hopefully in the near future we will see a shaft drive bike that doesn’t weigh 40 lbs! Charge Bikes are hitting the coast, and with good timing. With the fixie-flatland taking off in the states we need something a bit tougher for those hard hitting crowd, more than a Bianchi Pista could take. A more reasonable $700 for a Plug complete bike made out of Tange. Finally after being pushed back about 8 months the belt drive bike from Trek, the District, is being shipped! One arrived at our shop this morning and we will be building it up this morning. Keep a look on this post as we update it with photos and a short spin around on the bike. 5:$5pm Busy day at the shop, click over at the latest post for full photos. 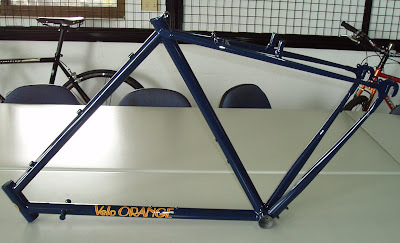 Our friends over at Velo Orange released some proto-type photos on their blog of two upcoming frames. 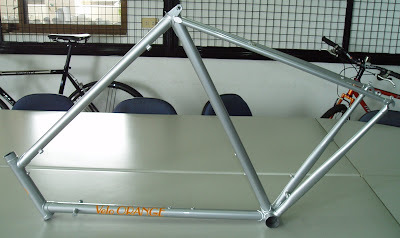 A randoneering frame and 650b city frame. Here are photos of the final prototypes of the VO production Rando and City frames. These frames, and the forks, should arrive here next week and I’ll have more pics then. I think the Rando frame looks nice, but for three small things. The head tube probably will not be extended. The chain stays should should go higher up on the seat lug. That means using a longer cap (or plug), which is very easy to change. And I’m not 100% happy with the appearance of the rear dropout, though it will work perfectly well. I might search for one with more of a retro look. These small changes won’t neccesitate a new prototype, so if the bike builds up and rides as excpected they should be available in about 90 days. This frame has exactly the same geometry and tubing thicknesses as our semi-custom frame. Here is the 650b city bike. Again there are a couple of very minor changes we may want, but overall it looks good. I don’t have final pricing yet, my best guess is around $800 for the Rando and $450 for the City (including the fork). If all goes well with testing we’ll with break with tradition and accept pre-orders, or at least deposits, for the first production run. Inquiring with Tom, the General Manager of the wholesale side of Velo Orange, VO Imports, I learned more about what makes a city bike special. The Velo Orange city frameset is built around a 650b wheel, in 5 sizes. I don’t think anyone is making city bikes with 650b wheels. It has low trail geometry which makes it ideal for outfitting the bike with fenders with a minium of toeclip overlap. The handling is appropriate for a non fast city bike (your typical 10-15mph city speed), and is made with outfitting it with a front rack in mind. Our frame will be sold with a fork. There are brraze ons for fender braces, racks, bottle cages and cable guides. It has canti studs. The chain and seat stay bridges are positioned for a perfect fenderline. The frameset is TIG welded. We did this because it greatly reduces the cost, is plenty strong and is more discrete than showy lugs. You can lock this bike up without it attracting too much attention like lugged steel bikes do. It blends in. You’ll want to build up the city bike with a porteur rack and go to the farmers market, loading it up with groceries. It will be put into service as the errand bike, hauling big trash day finds, and lumber yard runs. Lance Armstrong and Bontrager today released more details regarding Armstrong’s recent collarbone surgery. While it was previously reported that Armstrong’s right clavicle was screwed and plated back together after his March 23rd crash at the Castilla y Leon stage race in Spain, Armstrong and equipment sponsor Bontrager, jointly announced that he was the world’s first recipient of an inForm® CarbonClavicle™ Upgrade. Originally slated to be released at the AAOS (American Academy of Orthopedic Surgeon) Convention May 18-24th in Las Vegas, Bontrager moved up the launch date of the inForm CarbonClavicle to aid the return of Armstrong to the peloton. “The original intent of the Bontrager inForm line was to use medical research to aid us in creating better cycling contact points, such as saddles, shoes, and grips. But when we did the research into the most common cycling-related injuries, the broken collarbone proved to be an area where we could actually help cyclists get back on the road sooner,” relates John Balmer, head of Bontrager Development. The CarbonClavicle, available for both left and right shoulders in four male sizes and four WSD (Women’s Specific Design) sizes, is an actual carbon fiber replacement of the clavicle. Developed with the aid of Sports Medicine Specialist Dr. Mark Timmerman, a Bontrager consultant, the inForm CarbonClavicle has greater shock absorption, greater impact strength, and a greater tensile strength—all while being grams lighter than the OEM bone. “The installation on Armstrong was completely coincidental. But I must admit, the Bontrager marketing team was doing high-fives when we heard about Lance’s crash. It really was a marketing god-send. I mean, could there have been a better way to launch the new Bontrager medical Upgrade line?” explains Chris Clinton, Bontrager Marketing Manager. The installation procedure is substantially quicker than the conventional collarbone repair procedures of stabilizing, drilling and pinning, as this is a full replacement. Essentially, the broken bone is completely removed and the CarbonClavicle is anchored in place. Armstrong’s procedure took approximately 30 minutes and will reduce his recovery time from 3 weeks, to 5-7 days for the sutures to fully heal. The delay in releasing details was due to an extended approval process with the UCI, which has now ruled that since this piece is structural yet provides only minor aerodynamic advantage over the traditional ‘bump’ of a healed broken clavicle, it falls with the current parameters of the UCI rules. Future sponsorship plans include full support and pre-emptive upgrades for the full Trek-Livestrong U23 team. “These guys are early in their careers, and if averages apply to the team, we think we can prevent about ten or more future breaks across the 12 members of the team,” adds Clinton. Backed by Bontrager’s best-in-industry 5-year warranty, inForm CarbonClavicles will be available through referrals from Trek and Fisher dealers exclusively. Retail prices will be set by the retailer. For more information, visit Bontrager online at www.bontrager.com. You are currently browsing the archives for the Urban Sneak category.